The ideal comfort food: rich, smoky bacon and the "World's Best Cheddar"! Wonderful product and great customer service! My husband absolutely loves this cheese. Found it once at a local grocer, but never found it again. Thank goodness for the website. Party Food, sliced with crackers. Slices well, not crumbly, great taste. I have and will continue to buy this product. We do buy this over and over. We tried it and fell in love with it. The flavor is amazing. one of our favs. I wish thusproduct was sold in stores in my area. I entertain frequently and thus cheese is always a hit! Originally purchased at Dakin Farm store and have ordered several additional packages. I use in scrambled eggs and breakfast casseroles, macaroni and cheese in cheese balls and with crackers. I give as gifts that friends love. 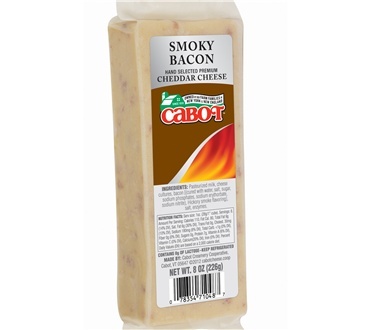 Great combination of light cheddar cheese and bacon flavors.